The cypher message reads: "MOST SECRET: Operation Chastise [stop] Immediate attack of targets X,Y,Z approved [stop] Execute at first suitable opportunity [stop]"
It is May 16, 1943 and 617 Squadron is about to fly its first mission - to crack open the mighty dams in the heart of Germany. Nineteen British Lancaster bombers specially modified to carry a most unusual ordnance sortie at dusk and fly at low altitude across the North Sea. Some hit the crest of waves and dunes, others clip the tops of trees and utility pylons. Desperate to stymie the Luftwaffe's radar system guiding its fleet of Nightfighters patrolling the skies, bomber crews maintain that precarious altitude across Germany. Negotiating a terrain of antiaircraft batteries, barrage balloons and dreaded searchlight arrays, and contending with feathered engines and other mechanical malfunctions, most of the squadron arrive at the dams in the dead of night. One by one the Lancasters skim across the reservoirs towards their targets, releasing the mine at a precise altitude, speed, angle of approach and distance. Four dams were attacked that night and two were breached. By dawn, eleven of the nineteen bombers would touch back down at Scampton in Great Britain, and its surviving crews would earn 33 decorations, including the Victoria Cross. 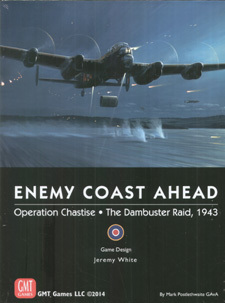 Enemy Coast Ahead is a solitaire game depicting that remarkable mission. It recreates the action over the reservoirs, the arduous flight to the targets, and the preparation and training for this special raid. Ten scenarios allow you to explore every aspect of the action, from the tactical predicament at each target to the problem of organising a squadron from scratch, equipping it, commandeering top airmen and groundcrews, and training it to learn untried tactics imagined by a slide-rule wielding engineer. The game is presented in program fashion, allowing you to play the first five scenarios after reading only Part 1 of the rules. Each scenario can stand alone or be combined, and each has a unique Debriefing Chart involving you in the raid's outcome. Will Albert Speer break delicate news to the Fuhrer? Will Air Marshal Harris of Bomber Command come to know the fate of every Lancaster, or must he endure the mystery of garbled transmissions and empty chairs in the squadron's Mess Hall? Part puzzle packed with tough decisions and part reenactment, Enemy Coast Ahead can be played with two or three players either cooperatively, or competitively. Can you breach a third dam, or will you be able to breach even a single one?